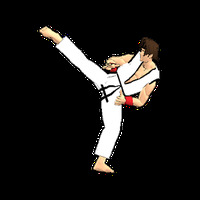 "Fight the enemies with your karate skills in this epic game"
Game Goal: Final Karate Demo is a karate game in which the user can challenge up to three wrestlers in four different stages. How to Play: Basically, the game consists of executing karate blows to finish off your opponents. Includes 20 different strokes. Game Options: It is possible to challenge up to 3 fighters in multiplayer mode. Graphics: Animations and graphics are a big disappointment. The characters have strange contours and low definition while the blows and falls of the fighters aren't at all realistic. Controls: The controls are made from taps on the screen, so the device has to be an Android Froyo or higher. Installation requirements: A minimum of 9.22 MB of free memory space and Android 2.2 or higher. Rating: The TOP 5 Most popular games in Karate Games category. Ranking: The TOP 5 Most downloaded games in Karate Games category. Do you like Final Karate (free)? Mix boxing with martial arts and defeat your enemies! Become a karate master from the palm of your hand!